Burgers are one of the most popular fast food items with numerous variations and regional flavours. 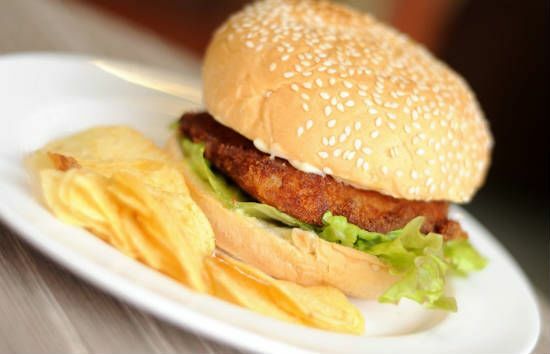 Burgers are typically associated with chicken or beef, but fish burgers are equally tasty and delicious. 1. Finely chop the fish fillets and transfer to a bowl. 2. Add the red chillies, spring onions, capsicum, salt, pepper powder and parsley. 3. Break the egg into the pan and mix well. 4. Using wet hands, shape the mixture into burger patties. 5. Heat butter in a pan over medium flame. 6. Fry the prepared patties on both sides until golden and slightly browned. 7. Do not cook them for long or they will become dry. 8. Apply mayonnaise and mustard on the buns. 9. Place some lettuce leaves on one half of the bun. 10. Place one of the cooked patty on top. 11. Top up with sliced on tomatoes and onions. 12. Cover with the other half and serve at once with fries. Feel free to comment or share your thoughts on this Fish Burger Recipe from Awesome Cuisine.